In February, my mother called to tell me a surprise party was being thrown for my grandmother’s 90th birthday the following month. It was to take place in New York, where she lives. That meant, in order to attend, I would have to hop a plane or drive twelve hours. “Do you want me to come?” he asked. “Then ask me like you want me to be there!” he said. “That would be great,” he said. Since he had lived in New York City for nearly ten years and had talked about going back for a visit, we decided to spend a few nights in the city prior to the party, then head up to the mid-Hudson Valley for a few days with my family. I opened my computer a few hours later and saw quite a few e-mails from Michael. He had already booked our hotel in the city. He had also sent flight options, leaving from the three airports closest to us. And he priced out a rental car. I could have cried I was so happy. As a woman who has spent the better part of the last fifteen years traveling on her own, having someone else do the planning was monumental. And it’s not just travel. Men who have a plan for a first date (how about we go to X restaurant at X time?) automatically score lots of points in my book. As a single woman, I have to decide everything in my life, so when someone else makes the choices for me, ah, that’s how I spell r-e-l-i-e-f.
That same joy overtook me again today. After hiking nearly seven miles, my friend and I reached the car. I checked my phone and noticed I had a few messages. I opened one from Michael to see a picture of–what? Is that . . . yes, it is! 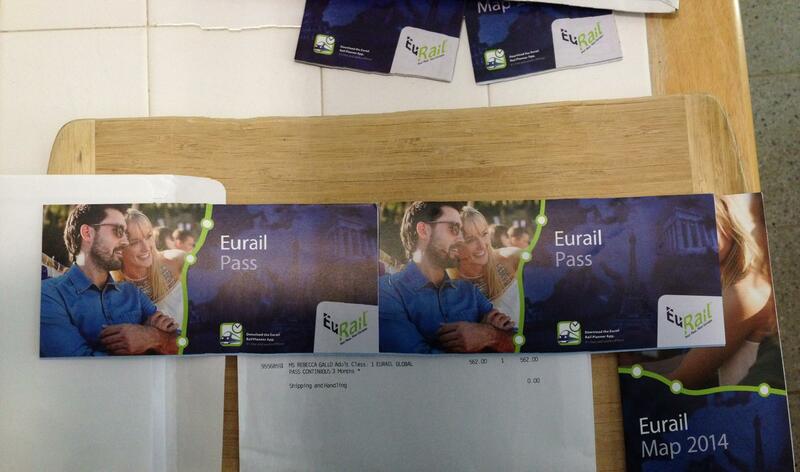 Our Eurail passes! There they were, in his possession, and I didn’t have to do a damn thing to get them there. He has also booked our first month’s apartment in Aix-en-Provence, and checked us in for our upcoming cruise. And has documented all of this in an app we both have on our phones. Well, now I feel like I’m bragging. And I am, of course. It is a good idea to give thanks for at least five things each day. And Michael is on that list most every day, and for that I am grateful. I sit on the porch, rain lightly falling around me. The roof over my head, the eaves hanging down, protect me–allow me to sit in the midst of nature, without the threat of bee stings, mosquito bites, or rain. I sit at the table facing one corner–the corner that looks out at the yard next door. The white picket bridge over the creek, a red leafed tree behind it, and beyond that a cherry blossom covered in white blooms. The rain means outdoor work has stopped, so this afternoon I will not be bothered by the yard workers revving their motors to maintain a lush green lawn that no one ever uses. The renovation on the house across the alley has also stopped, the sounds of their machines replaced by the sound of rain falling into puddles. I remember when my landlords first showed me this cabin. We entered the living room where a round wooden table dominated one corner. “That’s where you’ll eat during the winter,” my landlady said. I was a bit confused until we got to the porch. I recall last summer spending mornings in the chaise lounge out here, eating a bowl of yogurt and muesli, my glass of water on the green shelf next to me. I didn’t sit at the table mindlessly eating while reading a book. Breakfast was the meal I ate mindfully–or at least tried to. I recall packing lunches to bring to work, so I could eat quickly in the office, and thereby leave earlier in exchange for taking so little time for lunch. As spring blossomed I realized I needed a break at midday and drove home (a mere two miles) for lunch each day. I had time to cook if I wanted, or I simply took leftovers out to the porch. At the table birds provided my soundtrack, a book my entertainment, with commercial breaks provided by the squirrels. I recall those work days when my lunch hour just wasn’t enough, when I wished I could spend the whole afternoon out here. Indeed I did on weekends, when I spent entire days moving between the chaise lounge, book in hand, and the kitchen: eating and reading the only tasks on my agenda. There were entire months I ate every meal on this porch. “So you’re going to lose the cabin . . .” my mother said when I told her of my plan to head to France for three months. “Well, yeah. They’re thinking of selling the property in the spring,” which meant I could possibly be given one month’s notice to move anyway. I was thinking how sad it is to leave this place. Of all the homes I’ve had since leaving my parent’s house, this, by far, has been my favorite. When I first moved in I would often stop what I was doing to reach out and lay my hand on a log. I loved that I could see so clearly what my house was made of. No insulation or sheet rock hiding its bones. But it’s figuring out how to use up the food that brings me the most challenge–and the most fun. I feel like I’m in my own episode of Chopped–the TV show where three people open up mystery baskets to reveal a seemingly unrelated group of food items they must use to prepare an appetizer, entree, or dessert. One of the best parts of the show is the look contestants give when they see some of the ingredients. That same look crossed my face when I was handed corn grits as part of my winter CSA share. Having not grown up in the South, I had not the slightest idea what to do with them. I had tried grits a few times in my travels, and found only when combined with goat cheese did I like them. (And that’s not saying much. You can combine anything with goat cheese and I’ll like it.) So this past weekend’s mission was to find something to do with them. With no goat cheese on hand, I thought, How about polenta? The only time I’ve ever seen polenta made, let alone eaten it, was at a retreat center in Rhode Island where I served as sous-chef under an Italian woman. I remember being quite impressed at how good polenta was, but apparently not impressed enough to try it since then. I wasn’t even sure corn grits were what one used to make polenta. After entirely too much time on the internet, I learned there is great debate on the merits of using corn grits versus corn meal. Not much debate for me though: all I had were the grits, so I decided to give it a shot. Making polenta is a bit like making risotto: once you pour the grits into the water, you have to keep stirring. And stirring. For a half-hour my recipe said. “Until you can swipe a spatula through it, and the polenta doesn’t fill back in.” Which actually took fifty minutes. I pulled the pile of mush off the burner, my arms exhausted. It didn’t look very appetizing, but I wasn’t going to eat it like that anyway. The Italian woman had baked it and then doled out slices of it. So I poured my grainy cake-batter-like substance into a loaf pan, covered it with some Parmesan, and tossed it in the oven. The recipe warned that it was best to eat it right after it came out of the oven, and not to even think about eating it the next day unless you were going to fry it up in some oil, in which case they said it made one of the best breakfasts you’ll ever have. So after it finished baking, I cut myself a slice. I wasn’t impressed. I should have known better. If that Italian woman was anything like my own Italian grandmother, she threw in some other things when I wasn’t looking. Darn. I hoped frying a slice in oil the next morning would improve things. So what did I do? What all Italians do with food they don’t necessarily want to eat as is, but don’t want to waste: I dipped a slice in egg, then breadcrumbs, and then fried it up. The next day, I cut another slice off the loaf. I added basil, parsley, fresh ground pepper, and a little garlic to the breadcrumbs, and voila. Divinity. A wee bit of polenta covered in fried deliciousness. And Rebecca remains the Chopped champion of her own kitchen. “A choice between two things is not a choice. It becomes a fight between right or wrong.” I read the sentence again. As the afternoon sun warmed the page, I pulled out my pen to underline it. I had never thought of it like that. No wonder I hate making decisions. “We need a third thing, a way to step out of the conundrum.” I pulled my pen across the page again. Natalie Goldberg is brilliant, I thought. I sat on a park bench reading her book, “The True Secret of Writing” hoping to get my creative juices flowing again, and it was working. What I didn’t expect was to have so many life lessons pop out at me. The chapter went on to explain that this “third thing” is not something that we will come up with. And it won’t present itself overnight. But the idea is that if we open ourselves to the possibility of a third thing, it will show up. 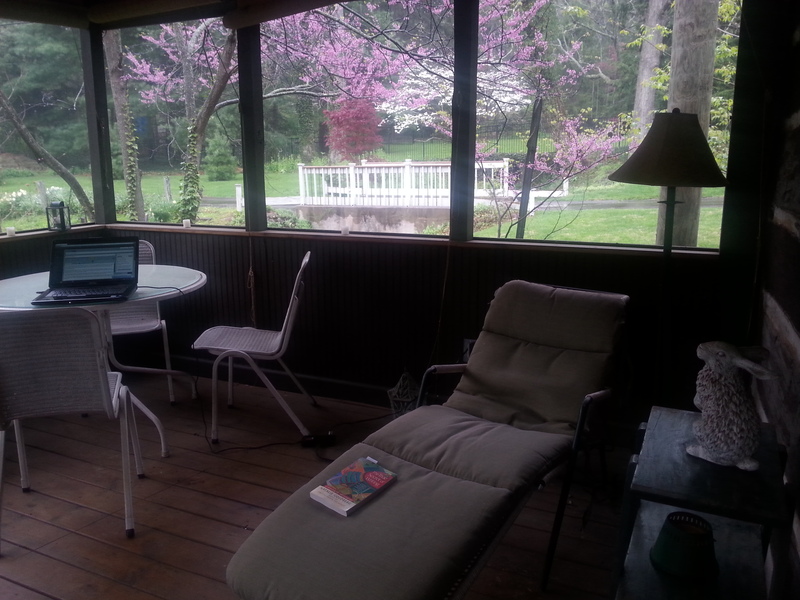 So I got down to writing, as the book instructed. What decision was I struggling with? Work. Duh. Six weeks earlier I quit my job thinking I had the perfect idea of what to pursue next (travel writing) only to find myself stymied. By what? I wasn’t sure. So I looked at other options. And though I had many, it was really a struggle between two lifestyles: that of employee–my work life dictated by someone else–or that of the self-employed. I barely filled up a page. I had debated this so many times I was sick of hearing myself. I closed the notebook. Four hours later, my third thing showed up. Well, let me clarify. Yes, four hours later Michael and I decided we were moving to Europe. But like Natalie described, this decision had evolved over time. Michael first showed up at my door five months earlier, homemade key lime pie in one hand, a mystery box in the other. Had he shown up empty-handed, I still would have been intrigued because I knew he had just returned from nine months in Central America. The majority of men in my dating pool have settled into a work life, a family life, a home life. I tried to fit into that, but, as my friend Jen said the other day, I am “a beautiful square peg” and I should stop trying to smooth my edges to fit into a round hole. I had a feeling Michael wasn’t a round peg either. I don’t have many regrets in life. In general, I feel like I made the best decisions I could with the information I had. But there is one: I wish I had spent a year living in another country. It was part of my plan. After spending six weeks living with a French-speaking family in Switzerland the summer before my senior year of high school, I knew I wanted more of this experience. I’d heard college was a place where one could do something like this, so instead of doing a “gap year” (taking a year “off” between high school and college to do something incredible), I followed the crowd. To this day, I can still see the moment my dream crashed and burned: I sat with my parents in the auditorium of Jefferson Hall at the University of Scranton. The fifty of us who had been accepted into the physical therapy program sat with our parents while the chair of the department explained what we was ahead of us. “Does anyone have any questions?” she asked. She paused and looked at me like I had three heads. She explained the rigorous program, how we were not required to take all the general education courses because we had so many PT courses to take, how we had to start those courses in our junior year. Junior year: the year most students study abroad. I don’t remember anything else after that. Recalling that conversation still brings tears to my eyes twenty years later. Michael was twenty-seven when he moved to Paris. He spent three months at the Sorbonne before deciding to move back to New York. He’s regretted it ever since. What was brewing here was a perfect storm. Michael’s mother planned on him joining the family on a Mediterranean cruise this summer. Since the day I met him, I knew he didn’t want to go, and I understood. We’re not cruise people. If we’re going to visit a place, we’re not going for a day or a week. “Are you saying we should go?” he asked. “Of course ‘we.’ You think I’d go without you?” Well, frankly, yes. This was the first time the idea of me going had ever come up. I stumbled over my words. I wasn’t a cruise person either. This wasn’t something I budgeted for when I quit my job. But I figured the ports in the Mediterranean wouldn’t be the tourist traps I had seen in the Caribbean. And I had frequent flyer miles–enough to get us both to Europe. “You know, if we’re going to go, we should go earlier,” he said. Yep. If we were going to Europe, we were going for at least a month. Hell, why not a year? And with that, my third choice appeared before me.